Shine bright like a diamond (or an amethyst or a geode). The Perot Museum of Nature and Science just finished polishing its crown jewel. Tomorrow, the Lyda Hill Gems and Minerals Hall reopens after a brief closure with fresh exhibitions and a new strategic initiative called the Gems and Minerals Center of Excellence. The museum’s innovative “loan-versus-own” collection method allows it to regularly rotate out specimens, and this revamp has also brought a redesigned floor plan, bilingual content, and – my personal favorite – a monthly birthstone exhibit. The hall now boasts 37 cases, with four new signature displays including The Eyes of Africa, a giant fluorite from Namibia, and the 5-foot split amethyst geode fondly known by museum goers as the “grape jelly” geode. The birthstone exhibit is another one of the signature displays, with one case flaunting smaller specimens of each of the 12 birthstones, and another highlighting the current month’s stone with beautiful pieces of jewelry. For February, you’ll find an impressive necklace, ring, and earrings made with giant chunks of amethyst. Another sparkly addition to the galleries is the “Aurora Butterfly of Peace,” an artwork composed of 240 colored diamonds sourced from nearly every continent on Earth. The piece is only on loan to the museum through this spring. The new Gems and Minerals Center of Excellence, led by Kimberly Vagner, aims to elevate the Perot Museum into the international spotlight of the gems and minerals community. The Perot Museum Gems and Minerals Legacy Award has also been created to that end, with founding donor Lyda Hill receiving the inaugural honor at a ceremony this evening. 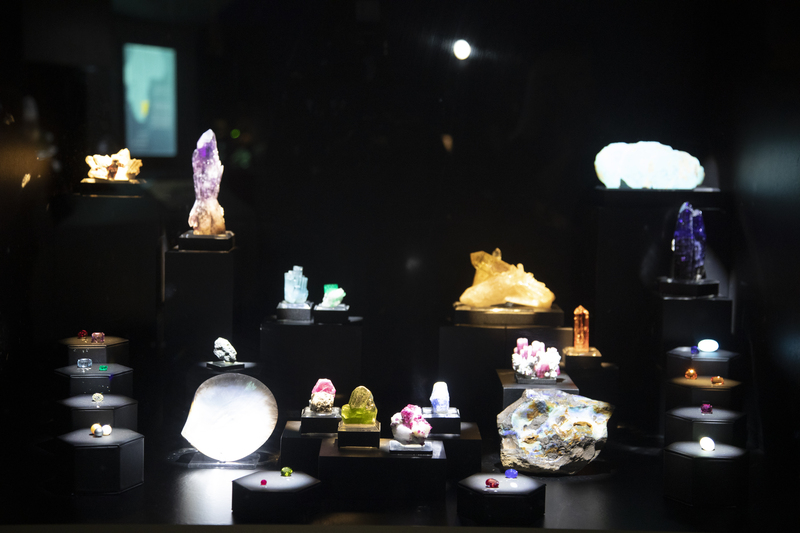 The Gems and Minerals Hall reopens to the public tomorrow, January 31, at 10 a.m.
New birthstone exhibit in the Lyda Hill Gems and Minerals Hall. Photo by JerSean Golatt.